Garlic Varieties - What's the Difference? There are three main garlic varieties, each with their own unique properties. Softneck Garlic is probably the most common type of garlic. It is the variety found most often in the grocery store. Softneck garlic usually features a white, paper-like skin. The head is comprised of several layers of garlic cloves surrounding the core. This is probably the easiest type of garlic to grow in a backyard vegetable garden. Varieties of softneck garlic feature a fairly strong taste and sweet, pungent odor. Most garlic heads that have been braided together are softneck varieties. Some varieties of softneck garlic include California Early, California Late, Silver White, Early Red Italian, Inchelium Red, Italian Late, Lorz Italian, Polish Softneck, Western Rose, Susanville and Creole. Hardneck Garlic is a less common garlic type. It features tan or purple markings. Varieties of hardneck garlic usually produce larger and fewer cloves on each head. They feature a fairly strong taste and sweet, pungent odor. 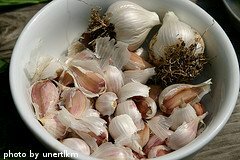 Hardneck garlic also generally has thinner, skin that is easy to remove. Hardneck garlic does not usually store as well for long periods of time as softneck varieties. 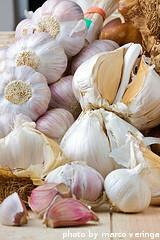 Some varieties of hardneck garlic include German Extra Hearty, Purple Glazer, Bavarian Purple, Persian Star, Duganski, Georgian Fire, Uzbekistani, Blanak, German Red, Music, Siberian, Metechi, Spanish Roja, Deerfield Purple, Mount Hood, Chinese Pink, Vietnamese Red and Roja. Elephant Garlic is a variety commonly found in grocery stores. It features a very large head that is comprised of very large cloves. In fact, some cloves of elephant garlic can reach about the same size as a whole head of softneck or hardneck varieties. We've even heard of some elephant garlic heads reaching the size of a softball! Some people assume that because of it's large size, elephant garlic has a much more intense flavor than standard garlic varieties. These people would be WRONG! Elephant garlic is known for it's very subtle flavor and mild odor. In fact, some garlic purists equate the taste of elephant garlic more with leeks or shallots than with other types of garlic.